Complete the application and fax it to 760-454-2494. You may specify staff members who are able to use the Easy Billing option on the application. Only those listed will be able to pay using Easy Billing. Call 800-991-6011 to order your products. Tell your Outreach Associate that you want to pay with Easy Billing. Order will be processed and you will receive an invoice via Fax. Church accountant pays the invoice upon receipt. Outreach, Inc. may hold orders pending receipt of the application document and satisfactory review. Only available for customers in the United States. Stock orders made by phone will be processed without a deposit. Payment will be due upon receipt. Account will be considered delinquent when any order is unpaid 15 days after invoice date. Account will be put in hold status when any order is unpaid 61 days after invoice date. No orders will be accepted or shipped when an account is in Hold status. Checks returned for insufficient funds or stop payment not authorized by Outreach, Inc. may result in any or all of the following: Cancellation of credit terms, termination of account, liability on applicant for a return check charge of $30.00 plus Outreach, Inc.’s reasonable attorney fees as allowed by law. 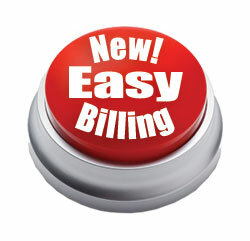 Easy Billing is not available for Customized or “print on demand” products.